Arguably the most judgy of the Christmas characters, Elf on a Shelf sits on high and gauges the naughtiness and niceness of everyone who passes—then sends his intel off to Santa. 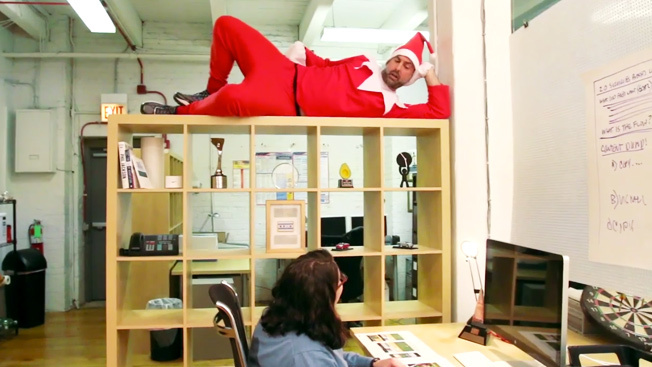 Agency Plan B put together this entertaining (and somewhat terrifying) video where clients can have their very own (human-sized) holiday spy peer into their agency and report back about all the inefficient business infractions. He comments on client briefs, monitors web browsing habits and even gives unwarranted life advice. But watch out—he'll even hit on you, too. There's also a pretty great gag site called Chimn-Ebay where you can shop for gifts like a "Santa's Twerkshop" workout DVD and Snowy SleighStation 4 gaming console. Take a look below at the hijinks that ensue when our hero hops of the shelf and shows a little too much jingle in his mingling. And definitely check out some of the extended scenes that follow.